It’s all about inconspicuous consumption in the Goose Nest these days. We’re all about freecycling, recycling and curbing gratuitous displays of bling. And it seems we’re on the money as far as Celia Walden is concerned. 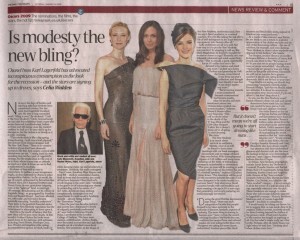 In her fashion and jewellery feature in Saturday’s Telegraph, it appears that modesty really is the new bling. This is exactly what our jewellery client, Robinson Pelham is all about: beautifully crafted heritage pieces that are designed for generations of wear.